Scene from the video showing the girl 'rotoscoped' with the live action singer. 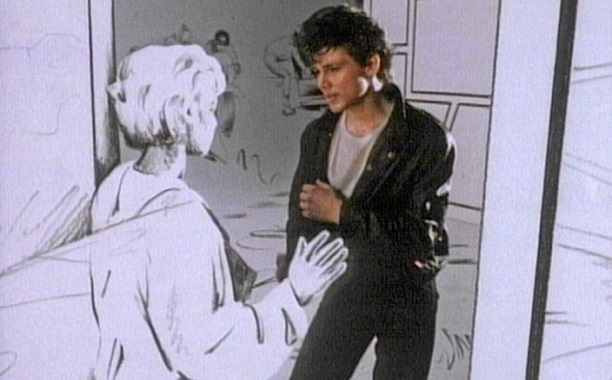 “Take Me On” is a music video by the Norwegian pop rock group A-ha which aired on MTV in 1985. I must admit that I like the “bubble gum” rock sound but I was mostly struck by the animated sequences in the piece, the prime reason it is showing up within the pages of One Eff Geof's Odd Creations. If you've never seen this award winning video, I have thoughtfully posted it here for your enjoyment. As you watch it, there are two animation / special effects styles that I'd like to discuss. One type is known as rotoscoping which is a technique where a live action image is projected on a drawing surface, one frame at a time. As each frame is projected, the artist or animator over draws the projected image in as much detail as he or she is interested in presenting. This could be just the actors themselves and/or the whole scene and any of the elements within it. In the case of this video, the black and white sequences are quite simple and generally only show the actors with very simple backgrounds. One may recognize a detailed versions of this effect particularly in Ralph Bakshi's films “Wizards” (1977) and “The Lord Of The Rings” (1978) and even in a few sequences in Walt Disney's “Snow White” (1937). The technique was invent by Max Fleischer in 1915 and first appeared in his “Out Of The Inkwell” animation series. I suggest that you Goggle the films I mention here to get a taste of what I'm talking about. A screenshot of the morphing scene from "Altered States" that is copied in the A-ha MTV video. 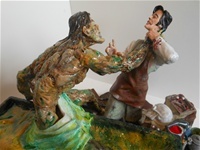 The second is substitution animation where the live action actor or scene (or both) are replaced with an entirely different image unrelated (as it were) to the scene itself. In this video, the climax is shot in a hallway where our hero throws himself back and forth from wall to wall. With each impact, his form alternates from 'live' action' to his comic book version. This scene very similar to the climax of “Altered States” (1980),an uneven but truly bizarre film where the hero in that film has the same kind of experience. In the video's case, it is very effective sequence, both visually and musically which accounts for the success of this video and, by association, it's song.